Setup Charge: $15.00 per imprint Color. These stick-to-anything universal custom stickers are removable without a trace and repositionable an infinite number of times! Stick and Re-Stick Your Promotional Message to Just About Anything. Budget Prices for USA, Canada for bulk universal stickers . These stickers can be placed nearly anywhere, removed and used again and again.• Leaves no sticky residue.• Adheres to most clean dry surfaces such as:- Stainless steel refrigerators- Laptops- Cabinets- Walls & Doors- Windows -Phones Desks. To use, simply peel from corner & adhere. Can be removed & used again up to 1 year on interior applications and 6 months on exterior applications. Ideal direct mail item. Imprint Area: the entire item area. Estimated Production: 5-7 working days after artwork approval; contact us for faster delivery. 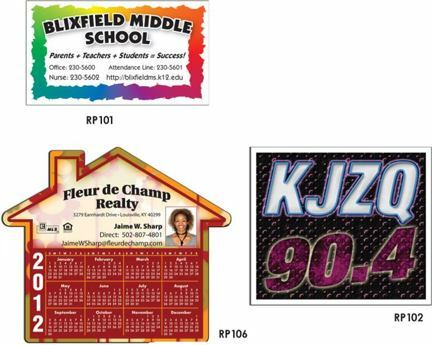 Custom Repositionable Stickers Personalized in Bulk. Promotional, Very Inexpensive. Lowest prices in the USA and Canada.